Note: Once the network traffic matches a policy, the Smoothwall does not apply any further policy matching. The Smoothwall contains a default outbound access policy which uses the Allow all port rule, and allows unrestricted outbound access to the Internet . For more information, see Managing Blocked Services . You can reorder outbound access policies to suit your requirements. If the outbound network traffic or service does not match any policy, the Default policy is applied. The Groups table is used to assign outbound access policies to traffic or services from users in an authenticated groups of users. Note: Group policies cannot be enforced in all circumstances. If a user has not actively authenticated themselves, using the SSL Login page or by some other authentication method, the user is unknown to the system and a policy cannot be applied. Group policies are often more suitable for allowing access to ports and services. In such situations, users have a reason to pro-actively authenticate themselves so that they can gain access to an outbound port or service. 1. Go to Network > Outgoing > Policies. 2. From the Groups table, click Add new policy. • Status — Select Enabled to enable the policy. 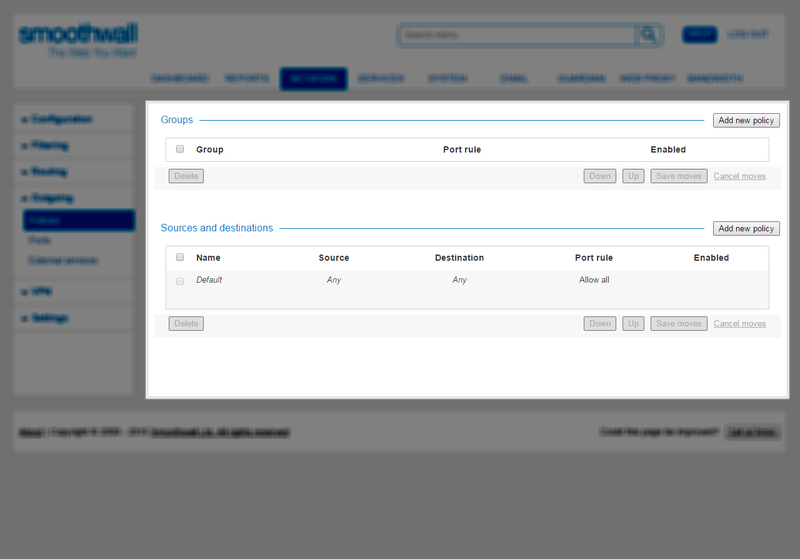 • Group — From the drop-down menu, select the group to which the outbound access policy applies. • Port rule — From the drop-down menu, select which port rule to use in the outbound access policy. For more information about port rules, see Managing Inbound Traffic with Port Forwards. • Comment — Enter a description for the policy. 5. Place the policy where it is required by selecting it and using Up or Down, or by dragging it to the correct position and clicking Save moves. Note: Once traffic matches a policy, the Smoothwall does not apply any further policy matching. When the source and destination IP addresses of outbound traffic match a policy in the Sources and Destination addresses table, the Smoothwall checks that the traffic does not break the port rules assigned to that source and destination. 2. From the Sources and destinations table, click Add new Policy. • Status — Select to enable the policy. • Name — Enter a name for the policy. • Source — Select if the policy to apply to Any IP address, or to the specified IP address, IP address range (x.x.x.x-y.y.y.y), or subnet (x.x.x.x/y). • Destination — Select if the policy to apply to Any IP address, or to the specified IP address, IP address range (x.x.x.x-y.y.y.y), or subnet (x.x.x.x/y). • Port rule — From the drop-down list, select the port rule to apply. For more information, see Managing Inbound Traffic with Port Forwards. 5. Place the policy where it is required by selecting it and using Up or Down, or by dragging the rule to the correct position and clicking Save moves. 1. On the Network > Outgoing > Policies page, point to the rule and select Edit. 2. In the Edit policy dialog box, make any changes required. See Creating Outbound Access Policies for Traffic from Sources and Destinations for information about the settings available. 3. Click Save changes to apply the changes and close the dialog box. 1. On the Network > Outgoing > Policies page, point to the rule and select Delete. 2. When prompted, click Delete to confirm that you want to delete the policy.